At the end of October I ran the Run LBL 10k. It was supposed to be my sixth half marathon, but I decided to drop down to the 10k the morning of the race. I still feel like I let myself down for doing so, but I wasn't really trained to run 13.1 miles and had gotten maybe four hours of sleep the night before thanks to a crappy hotel room and a 16 month old who didn't sleep. I knew that in my heart of hearts it wasn't happening that day. However, it was a really good race for me. I felt good the entire time and ended strong, not feeling like I was going to die. It took place at Land Between the Lakes National Recreation Area, which is located between Kentucky Lake and Lake Barkley in Kentucky and Tennessee. It's a really beautiful area and in the fall with the leaves changing it was awesome. And HILLY. Holy cow the hills. It's pretty flat where I live but I did incorporate some hills into the training I did do leading up to the race so I thought I would be somewhat prepared. Ha! Once we got off the highway and onto the roads in the recreation area, I gave up the timing on my intervals and just ran the flats and downhills and walked uphill. I had my phone on me, but I didn't take many photos since I was, you know, running. Once I reached the road to the finish, it was downhill and I ran all out to the end. I had texted Alan to let him know where I was and didn't see him until right at the end and almost missed the chute. If they people at the finish hadn't called me over I would've kept on going oops! Oh and when I took my shoes off to change afterwards, I discovered that my shoes had eaten holes in the heels of my socks. They were my favorite running shoes and needed replacing so I'm taking it as a sign that I was not supposed to run that half. Can you imagine how much my feet would hurt running another 7 miles? 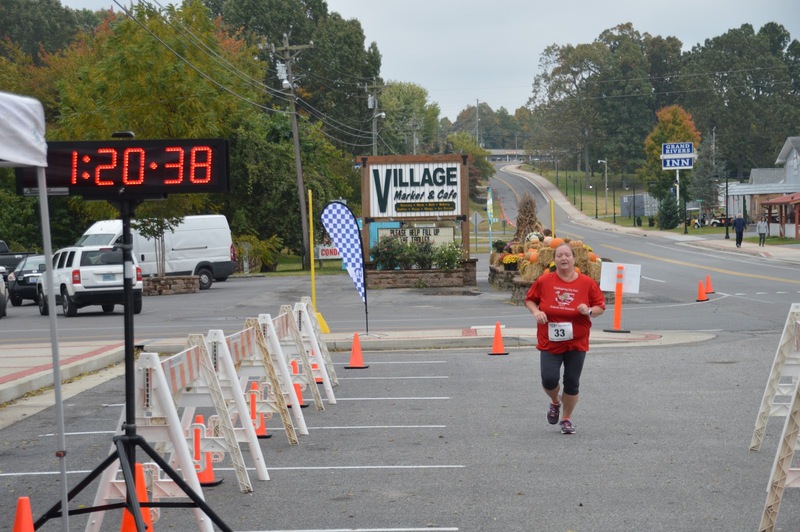 I've run faster 10k's as part of another distance, but this was my fastest 10k race. I'll take it!